So audiences may not have flocked to theaters in droves to check out First Man, but if you havenât you should (in IMAX if you can swing it). The story of Neil Armstrong and the first Moon landing reunites La La Landâs director Damien Chazelle and star Ryan Gosling for a biopic thatâs gripping, visually dazzling, and emotionally honest. For all of its quirks, First Man does fit within the tradition of NASA movies, but thereâs a lot more going on cinematically and thematically under the surface that points to broader influences and â" for our purposes â" movies worth checking out after youâve seen it. If youâ re among of people who rushed out to see Ryan Gosling be a distant husband to Claire Foy (physically and emotionally) or if youâre planning to see First Man in the future (and again, you should), these are the titles worth landing on next. All right. Letâs get this out of the way. Philip Kaufmanâs adaptation of Tom Wolfeâs book created the mold for the âspace programâ movie that Chazelle seems deliberate in wanting to break. In a few aspects, however, both The Right Stuff and First Man are great for the same reasons. As the story of the Mercury Sevenâs early failures and successes and Chuck Yeagerâs near-maniacal journey to break the sound barrier, The Right Stuff is an enormous movie. (Just check out that 192-minute run time!) Kaufman â" through Wolfe â" explored the era as the triumph of a group of men driven by common goals and some shared d emons. First Man foregrounds that darkness and casts the success as a side effect Armstrongâs grief. Even with their different approaches to a similar topic, the two play extraordinarily well together and would offer a full picture of what happens when we travel so far. Our apologies to anyone expecting out of First Man more of the colorful, Jacques Demyâ"inspired whimsy from La La Land. While gorgeously filmed in its own right, First Man is an emotionally reserved examination of an historical enigma â" with no tap dancing to speak of. In an interview with The Hollywood Reporter, the filmâs editor, Tom Cross, cited the work of documentarian brothers Albert and David Maysles as an influence on First Manâs vÃ©ritÃ©-infused style and rhythm. The connection calls to mind the film the Maysles brothers released (with Charlotte Zwerin) the very same year Armstrong walked on the moon: Salesman. The doc follows four door-to-door bible salesman, peddling their blessed wares across the country in hopes of finding their American dream. Itâs a much more grounded look at drive and desperation and how the two meet. For all of its prestige-y trappings, the biopic genre is one of modern moviemakingâs stalest. The bland, just-the-facts(-ish) approach still crops up every fall to snag a couple of acting nominations and nothing else. A truly cinematic biopic like First Man is rare â" but there is an example from just a couple years ago that pairs nicely and happens to overlap both historically and thematically. 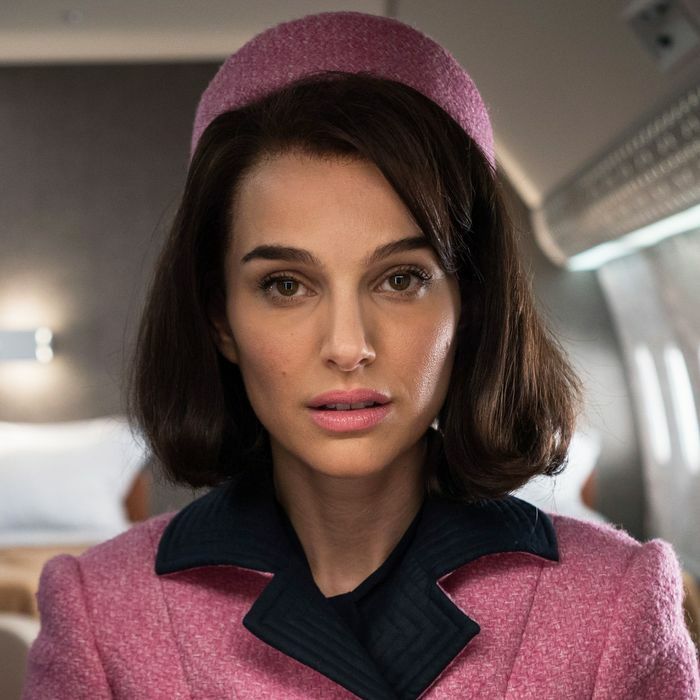 Pablo LarraÃ­nâs idiosyncratic Jackie O movie was more than a great Natalie Portman performance. Jackie casts off a traditional timeline and structure to infuse nearly every minute with dread, grief, and pain. Like First Man, it foregrounds the emotion that drove the people who made history. One of the elements of First Man thatâs so engrossing is the attention to period detail. The costumes, settings, and technology â" especially when it comes to the NASA equipment â" seem painstakingly researched. I mean, why else would you do that to Goslingâs hair? For All Mankind essentially serves as that thing in biopics where they show pictures of the real people before the credits roll, which First Man doesnât do. The documentary strings together a treasure trove of archival footage from the Apollo mission â" including some of the earliest images of a complete, definitely round Earth â" to make a really complete snapshot of the era and a testament to the verisimilitude of First Man. Cross also told THR that to capture the sense of gritty realism that Chazelle wanted, they watched two classics that pioneered the aesthetic: Gillo Pontecorvoâs 1966 wartime drama The Battle of Algiers and William Friedkinâs The French Connection. Between the two, weâre giving the tip to The French Connection for its look at American life and also the fact that its source material, a nonfiction book by Robin Moore, hit shelves in â69. Apart from containing one of the best car chases of all time, the movie offers a look at Brooklyn around the time of Apollo 11, when gentrification was just a twinkle in the boroughâs eye. Kennedyâs presence looms large in First Man, by both setting the Moon as a goal for NASA and appearing posthumously near the end of the film, when that goal was finally achieved. The film subtly underlines that particularly tragic aspect of the Moon landing. First Manâs cinematic style is also tangentially indebted to Kennedy, and Primary, a documentary about the battle for the Democratic nomination in 1960 between Kennedy and Hubert Humphrey, was an early entry in the cinema vÃ©ritÃ© style mimicked by First Man. Thereâs a moment at the end of First Man where the filmâs intentions are fully revealed. Armstrong stands on the edge of a lunar crater, staring out over the vast stretches of an alien landscape human eyes have never glimpsed before. Itâs the culmination of decades of work, determination, and â" importantly â" moments he missed at home. And even standing there on the surface of the Moon, the memory of his daughter, Karen, who died when she was 2, is with him. The deeply personal juxtaposed with the cosmic is the thematic hinge of Terrence Malickâ s opus, The Tree of Life. And now that an almost entirely new cut exists on the Criterion release â" with even more from the 1956 Texas sequences â" itâs a great time to revisit. First Man is largely about the impact one manâs single step made on the course of human history. Deeper inside its story, however, is a look at how the loss of a child changed a manâs soul and what happened when that grief rippled out from there. David Loweryâs gorgeous and brilliantly odd indie takes a similar perspective, but gives that loss form â" a white sheet with eye holes, to be specific. A Ghost Storyâs exploration of mourning â" surprisingly â" expands to a similarly grand scale as First Man, making literal how immense and eternal the loss of a loved one can feel.